We are pleased to unveil three new ranges, the IWS a IP68 Stainless steel washdown scales, the IBS a bench checkweighing scale and its big brother IFS a floor platform weighing scales. 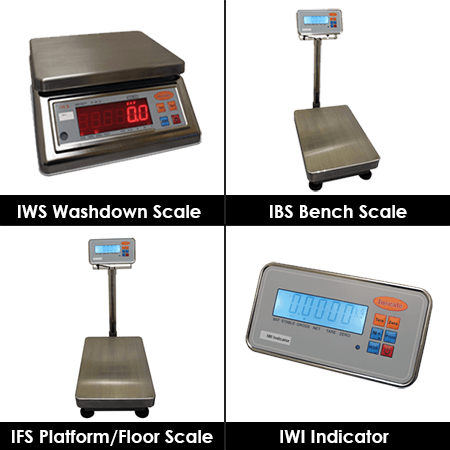 Ideal for industrial, food and retail applications, the IWS, IBS and IFS range of scales combine intuitive features with heavy-duty construction to offer high-performance weighing for a wide variety of commercial weighing tasks. The IWS washdown scale boasts an IP68-rated stainless steel construction that has been hermetically sealed for top-quality protection against liquids. The IWS includes built-in checkweighing with a red LED display and easily adjustable high and low limits. This scale can easily fit on a worktop or workbench surface and is ideal for professional kitchens, catering businesses, line packing and food production warehouses. Our IBS bench scale is a durable weighing machine with a compact design suitable for use on a workbench surface. The IBS is constructed from a mild steel base, combined with the new IP68-rated IWI checkweighing indicator that includes a vivid LCD display and adjustable high and low check limits. Fast and accurate checkweighing makes this scale perfect for busy commercial warehouses, manufacturing plants, packing facilities and production lines. IFS platform scales are designed for use on a warehouse or factory floor surface and provide an alternative to the IBS. The scale features a mild steel base, large waterproof stainless steel weighing pan and high weight capacity up to 600kg. Suitable for factory production lines, packing facilities and general warehouse applications. Inscale UK are committed to providing top-quality weighing scales and equipment at affordable prices. For more information about any of our latest range of weighing scales, please contact us.